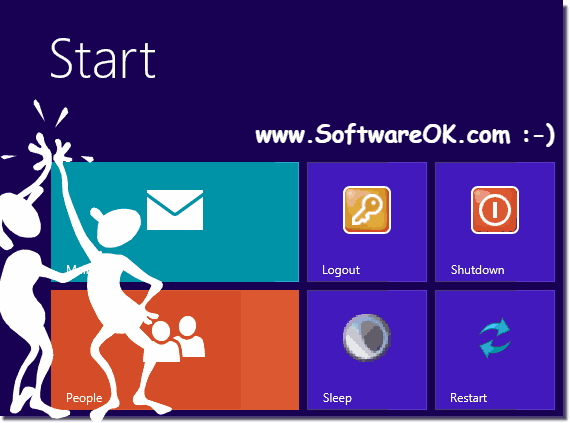 Create a Windows 8 / 8.1 desktop shortcut for fast shut-down, turn-off, logout or restart and / or pin to Windows 8 start! It is possible and easy but if you do not feel like creating them yourself, you can download my prepared shortcuts! 1.) ... But if you want to create the Windows 8 Desktop shortcut yourself! 2.) ... Pin the Desktop Shortcuts (Restart Shutdown Logout) to Start Menu. 3.) ... How to works a windows desktop shortcuts! See also: ► Stop laptop from going to sleep when closed! ► shutdown feature in To-Tray area! ► auto login! 1.) But if you want to create the Windows 8 Desktop shortcut yourself! Press the Windows-8 key combination [Win-Logo]+[D] to see the Windows-8 desktop. You can optionally also use the argument "/f", this will force the closure of application executed without warning. Then just follow the link name, this would be a "shutdown" or "off" attached as a link name;). 2.) Pin the Desktop Shortcuts (Restart Shutdown Logout) to Start Menu. Please do right click on the desktop shortcut and select "Pin to Star" (... See Image-2 Arrow-1). 3.) How do desktop shortcuts work! A Windows shortcut is a user-defined or system-defined shortcut to an item that is available on your computer or on a network, which can be a program, a file, a folder, a drive, a Web page, a printer, or another Be a computer. You can insert links in different areas, eg on the desktop, in the Start menu, or in certain folders. For the link a symbol can be defined, working directory, program arguments / parameters! But it is a full-value file that contains this information, the file extension is .lnk., which also allows Windows to recognize it and read the information from it. See also: ... program links in Windows 8.1 / 8! (Image-4) how do works a Windows desktop shortcut! 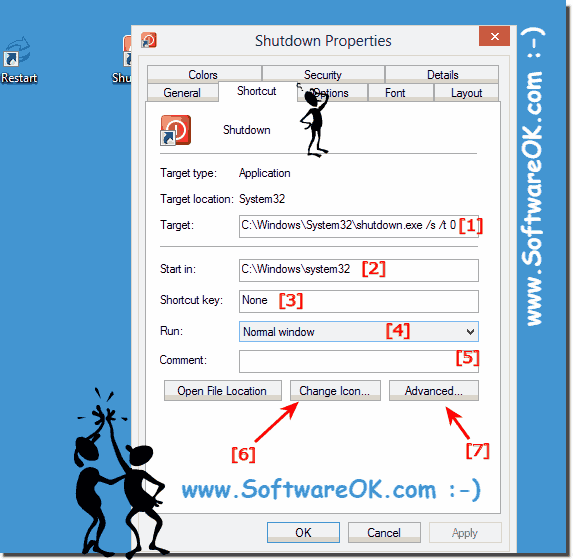 Windows-8 - FAQ-24: Create a Windows 8 or 8.1 desktop shortcut for fast shutdown, log off, restart?